You can go outdoors...except your allergies start to kick in. Warming weather brings buds and leaves, migrating birds and greenery everywhere, increasing sunshine, as well as itchy eyes, running noses and sometimes ticklish throats. What's a person to do? You are tempted, probably, to just chug-a-lug the Benadryl or pop the Claritin, to suppress these obnoxious symptoms. Better yet, hide indoors, where pollen can't get to you! But, as an avid backyard gardener, I gotta tell you that staying inside won't work for me! Imagine how happy I was to find these six natural remedies for allergy relief. Courtesy of nutritionist Pamela Bond, who writes for the magazine "Delicious Living" here are six natural allergy fighters you can try right away. Vitamin C acts like a natural antihistamine, which means that it reduces that nasty swelling up and over-production of mucus when our body's immune system detects trouble. Allergy = immune system overreaction! Vitamin C helps with this part of your body's unwanted actions, declares naturopath Paul Anderson. Recommended procedure: start with 500 mg vitamin C with meals (three times a day) during allergy season; gradually increase to 2000 mg total per day, if it doesn't bother your stomach or bowels. Quercetin, the pigment in fruits and vegetables that makes them darker color, is an antioxidant bioflavonoid. Like vitamin C, quercetin slows the production and release of histamine. Naturopath Anderson recommends taking 1 to 3 250-mg capsules of quercetin, again, three times daily with meals until hayfever season is over. Pulsatilla works differently than those above: instead, it reduces phlegm in your lungs and sinuses, which helps relieve breathing problems. It's a homeopathic remedy, so you'll find it in health food stores or homeopathy supply centers. Honey from the local bees has been proven to work like homeopathy on allergies. Says Ron Hoffman, MD, from New York City, "You get a little bit of what bothers you and then build up a resistance to that allergen." 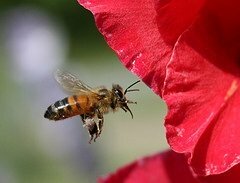 Because of the tiny bit of pollen in the honey, your body can accept airborne pollen without raising the alarm. Why local? Because it has the allergens that are floating around your neighborhood, so to speak. It's also important to use raw (uncooked) honey....and no one under age 2, since raw honey may contain a deadly bacterium that can cause botulism in those with weak or immature immune systems. Aromatherapy recommends eucalyptus, inhaled either from a conventional cough medicine, such as Vicks VapoRub, or as part of a steam inhalation. To prepare the sink, add a few drops of eucalyptus essential oil to a sink that's full of hot water. Lean over the steam, with a towel draped over the back of your head. (Its ends should rest on the sink countertop.) Breathe the steamy plant oil until your throat and chest relax and your breathing passages are eased. Give your nose a bath--or a shower, actually! With a neti pot, rinsing your nasal passages becomes quite easy. Once a day (best time is after exposure), fill a neti pot with 1/4 teaspoon salt to 1 cup of warm water, tilt your head to one side, place the spout of the neti pot in the upper nostril, and lean over the sink. Gently pour the water out, and it will flow through your nasal cavity to exit at the lower nostril. Then, you do the other side; this saline irrigation flushes out mucus, and rinses out any pollen sticking around in your nose. In my research (sniffing around, as the "Health Hound"), I found many over-the-counter products for rhinitis (the scientific name for upper respiratory allergies). These conventional medicines seem to all have one goal in common: to suppress symptoms, which is a relief for the 50 million allergy sufferers, surely. As years go by, too, pharmaceutical companies expand their lines of products, always looking for ways to make them user-friendly, and increasingly popular. From allergies to Homeopathy page! This way to our Home Page.